The Program Transparencies are visual tools that enrich your chapter presentations. 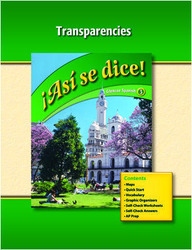 Vocabulary transparencies include photos and art of the Vocabulario section of the student edition. Map transparencies illustrate the geography of the Spanish-speaking world. Quick Start transparencies offer a brief review for each lesson. Pronunciation transparencies AP Proficiency Practice provides oral/written practice for the AP exam and may also be used for assessment. Assessment transparencies replicate the Self-Check for Achievement pages of the student edition.